It’s all about the bugs in our family lately. The kids have been playing and exploring outside most days. And along with the sunshine, the bugs have started making an appearance as well. 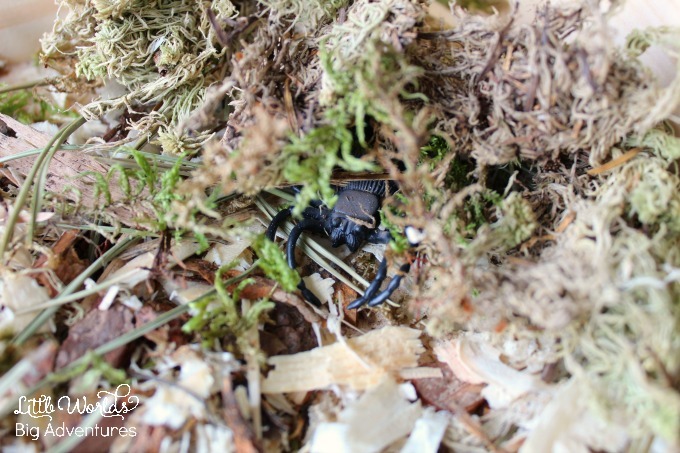 Everyone is full of questions and my boys would just love to see some of the bugs up close. 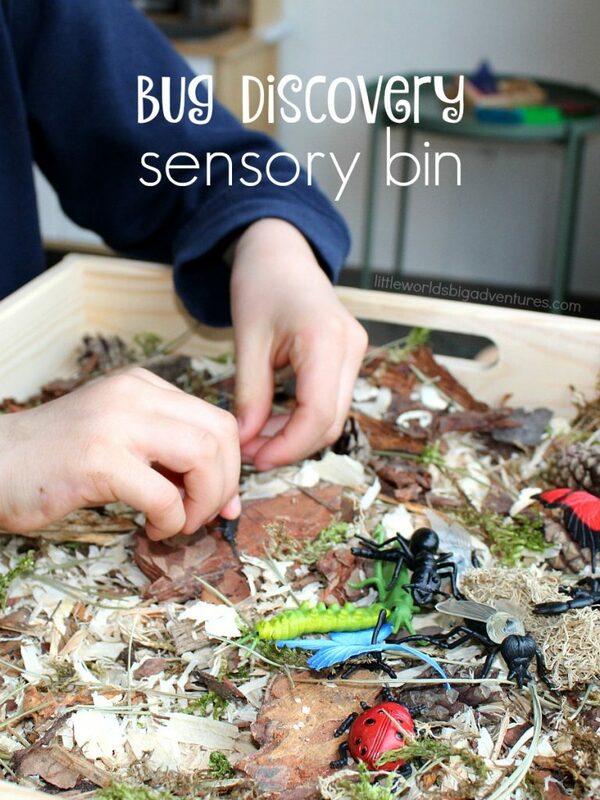 Wanting to respond to their interests, I set up a simple bug discovery sensory bin which is a great starting point for some excellent play based learning for ages 2 to 8! Have a look at how it all came together. 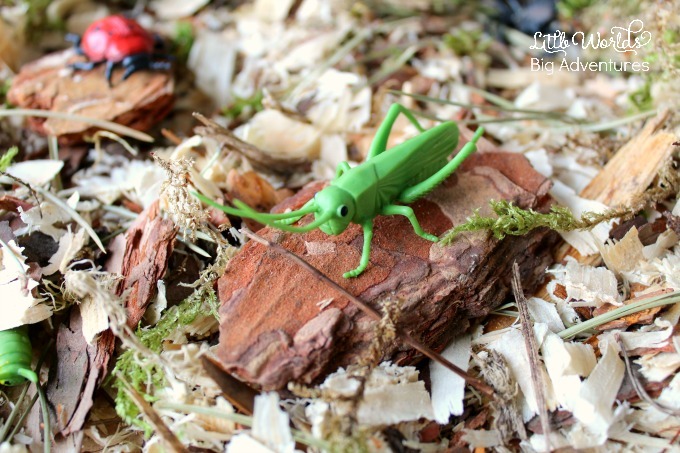 While this is a simple and pretty straight forward activity, let me talk you through the materials I used and the thoughts that went into setting up this fun invitation to play, explore and learn all about bugs. 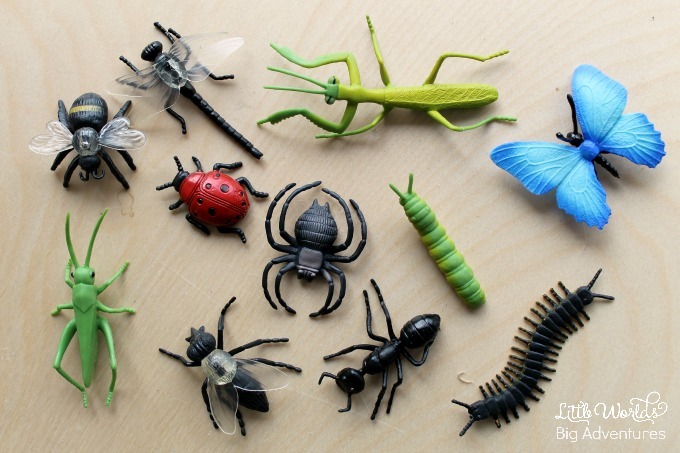 We used the Safari Ltd Insects TOOB, which is fabulous. I love that brand. 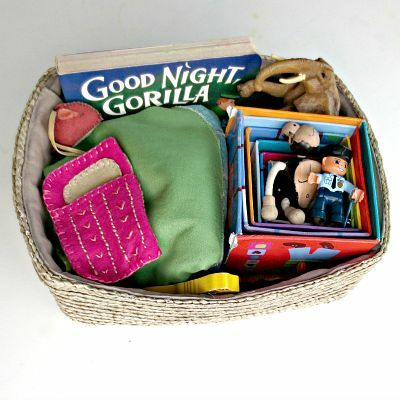 The animals are fun, the right size, sturdy and the toobs come in great combinations. Plus they’re pretty affordable. You’ll need a container of some sort. I found a kitty litter box in the dollar store which was the perfect shape, size and colour. You can use whatever you want. 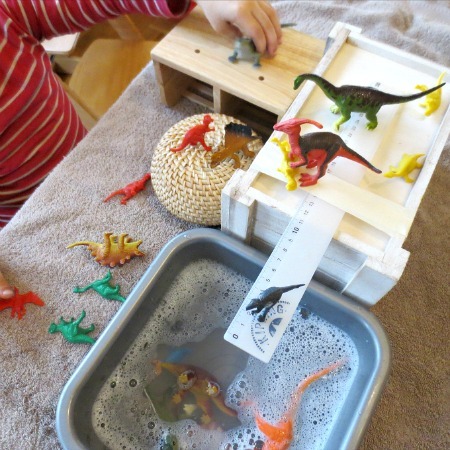 Think about size, depth, cost, anti-slip perhaps and anything else you think might make the activity run smoother in your home or classroom. 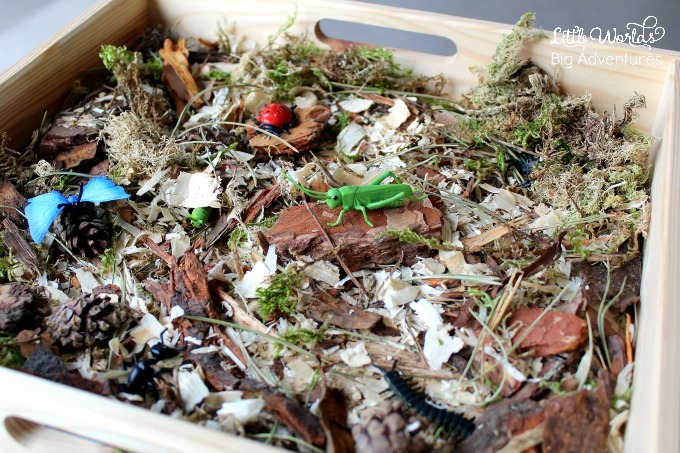 For this sensory bin, I used the organic natural forest floor bedding for our hamster cage. When I found the bag (which was not even $3!) 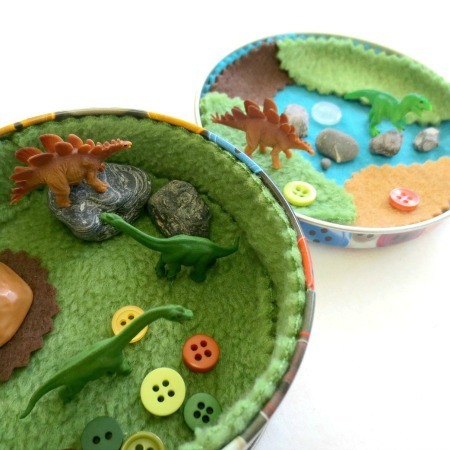 I knew it would be perfect for small world play and nature sensory bins. I couldn’t find a link on Amazon for you to have a look at but if you happen to pass an animal shop, you might want to pop in to see if they have some. 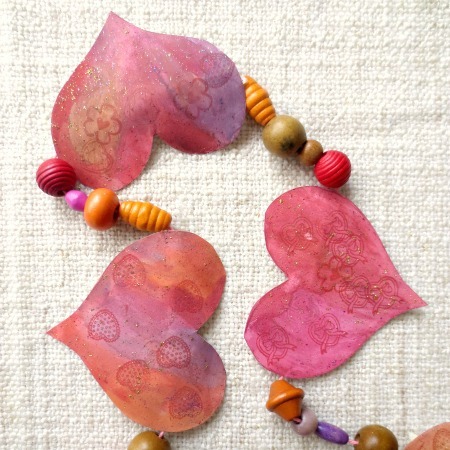 If not, get creative and use whatever you’ve got: wood shavings, actual forest floor bedding and so on. Since my kids are 2, 5 and almost 8 years old, they tend to play, explore and learn in different ways, which is pretty amazing to watch! The toddler will be very physical and focused on the sensory aspect. We didn’t go outside too much this winter so getting his hands on nature elements is very exciting for him. He’s not familiar with all of the bugs yet so there is a lot of pointing and naming going on as well. Games as hide and seek continue to be a winner. My preschooler is very much into pretend play at the moment. He’ll come up with all kinds of scenarios and prefers to be left alone when he’s engaged in his imaginary play. 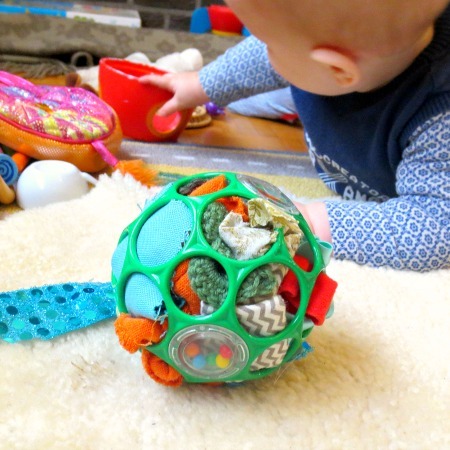 Mister T has always loved sensory play and really enjoys exploring the feeling of different materials on his hands and feet. 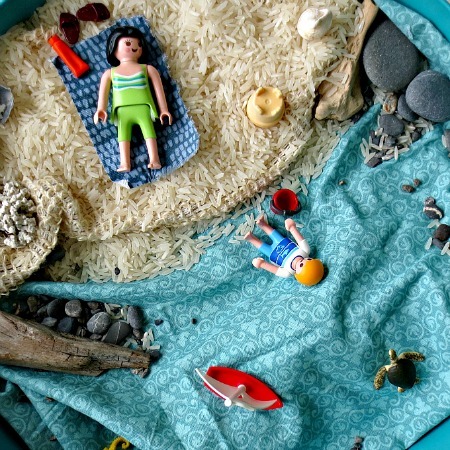 He’s also the explorative type of kid which means he’s the one that will get very creative and often makes me wonder why I thought it was a good idea to set up a sensory bin in the first place. The eldest, even almost 8, still loves a good invitation to play and explore. She’ll often follow up on an activity with some self initiated art work or will want to watch documentaries and read books to learn more about bugs. I find myself loving this age. It’s so much fun to see them actively figuring out the world around them, asking questions and wanting to hear what you’ve got to say. 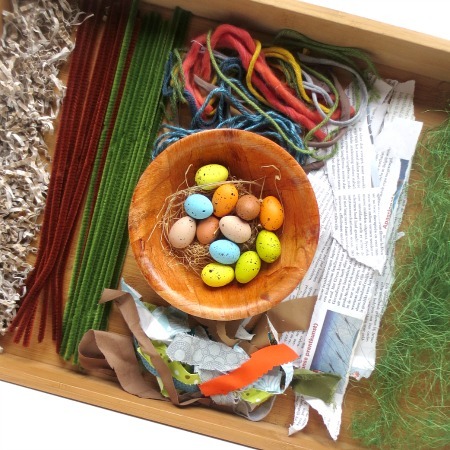 Sensory bins are great ways to introduce children to all kinds of things, from educational themes like name recognition to small world pretend play. 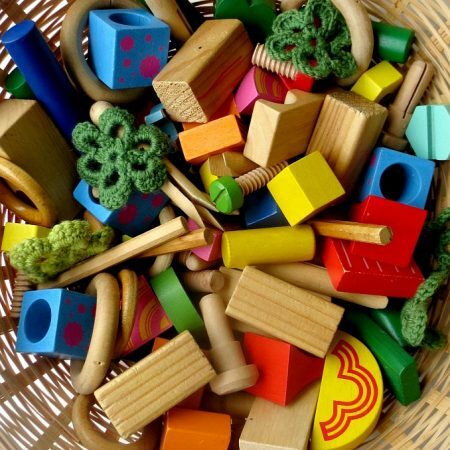 When kids play, they learn and learning happens through all of the senses. Which is exactly why sensory play is so important for child development … all throughout childhood! 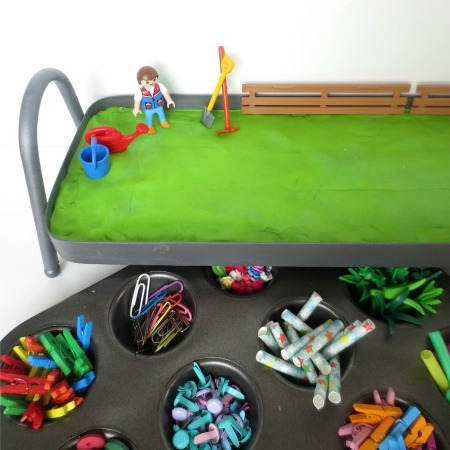 Have a look at our other sensory play ideas here for more sensory play inspiration. 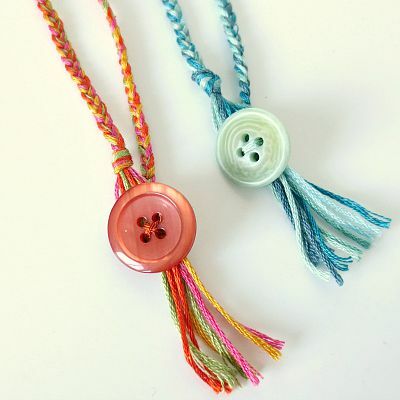 And with spring having arrived, you might want to check out our spring themed activities here.